Dependencies between classes are somehow double faced. Classes need other classes to do their work because code has to be broken down into small chunks to be easier to understand. On the other hand, growing quadratic with the number of classes (n nodes can define up to n*(n-1) directed edges in a graph), they can be a major source of code complexity: Tight coupling, Feature Envy and cyclic dependencies are only some of the problems caused by relations between classes "going wild". I try to avoid (too many) usages of other classes in my source. But it's not that easy. Consider a class in some legacy code base that shows signs of Feature Envy for classes in another package. Should I move it there? To be sure I need to know all classes my class is dependent upon? I mean all classes, so checking imports does not help. Even if I forbid wildcard imports (what I do), that are still not all classes. Classes in the same package are rarely shown by tools. Even my favourite Code Analysis Plugin (CAP) for Eclipse does not show them. 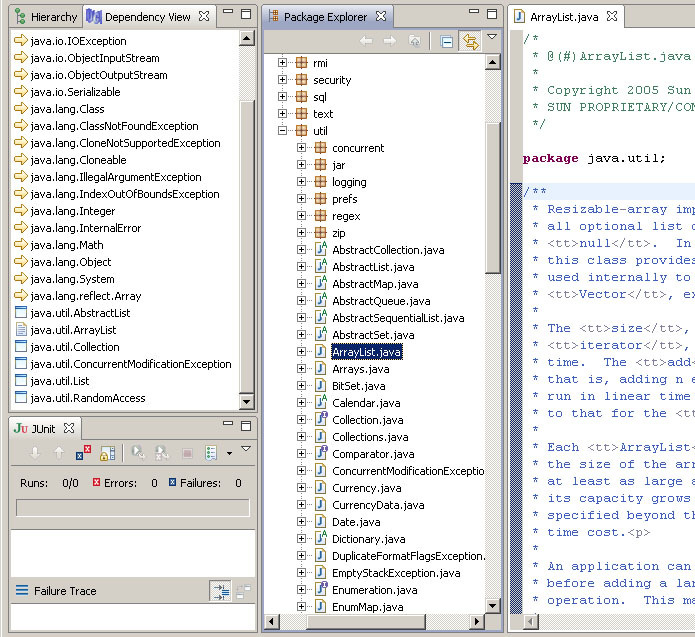 So here is my little, crappy, amateur Java Dependency View Plugin for Eclipse. Unpack it and put the jar into Eclipse's plugins directory. 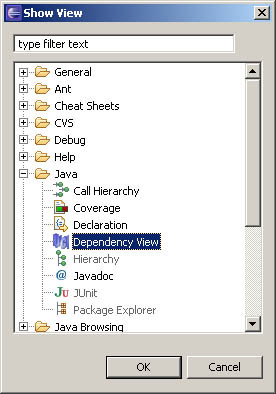 Restart Eclipse and open the Dependency View. (The small blue icon is my old coding-logo, a bit skewed.) In the view you'll see all kinds of outgoing references: inner classes, classes in the same package, other classes, generic types and sometimes - a bug in the view. The plugin was developed with Eclipse 3.2 and tested in 3.3. Source code is included in the jar. A nice feature, that I was not able to implement would have been reverse search, i.e. a list of all classes depending on the current selected one. If you happen to know how to to that, i.e. how to search for all classes that refer the current class, drop me a note.